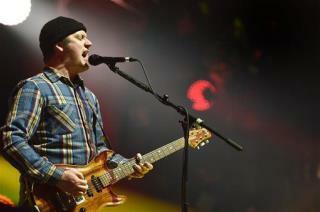 (Newser) – The lead singer of the alternative rock band Modest Mouse was sued Wednesday in an Oregon court for nearly $1 million over a traffic accident last year, the AP reports. Isaac Brock was cited after the Aug. 3, 2016 accident for crashing into a city of Portland pick-up truck when he fell asleep at the wheel. He was not charged with a crime. In the lawsuit filed in Multnomah County Circuit Court, city employee Cassidy Kane claimed the accident caused herniated disks in her spine and did other tissue and muscle damage that continues to cause her pain and numbness in her extremities. She will need steroid injections and may need surgery, the lawsuit said. The lawsuit asks for total damages of more than $865,000. At the time, police said Brock failed to stop as he approached traffic that was stopped near the Morrison Bridge in downtown Portland. He hit the back of the city truck, which hit a Subaru, which hit another Subaru, which likely hit a fifth car that left the scene perhaps not knowing it had been tapped. The singer told police he had fallen asleep at the wheel. He was evaluated for signs of intoxication, which officers could not confirm. There were no signs Brock was impaired, so police cited him for careless driving and he has since paid a $435 fine. Modest Mouse's biggest hit came in 2004 with "Float On" from the album Good News for People Who Love Bad News which opens with the line, "I backed my car into a cop car the other day." '...traffic that was stopped.....He hit the back of the city truck, which hit a Subaru, which hit another Subaru, which likely hit a fifth car that left the scene perhaps not knowing it had been tapped." Geez...how fast was he going? And doesn't anyone keep their foot on the brake when stopped these days? "alternative rock band Modest Mouse" Are they a local bar band somewhere? Never heard of 'em.